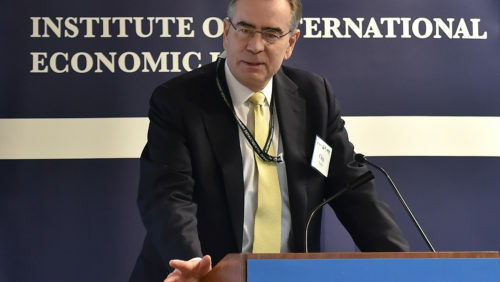 Chip Harter, Deputy Assistant Secretary for International Tax Affairs at the U.S. Treasury, delivers the keynote address at "Reimagining Taxation in the Age of Digital Disruption" at Georgetown Law December 3. In a digital economy, taxation needs to adapt as much as securities and financial regulation or indeed, any other area of the law. Just one month after Georgetown Law’s Institute of International Economic Law sponsored its successful “Fintech Week” conference November 5 to 8, IIEL talk turned to “Reimagining Taxation in the Age of Digital Disruption” — hosted at the Law Center December 3. Georgetown Law Professors Lilian Faulhaber and Itai Grinberg, and Jeffrey Owens, director of the Vienna University of Economics and Business Global Tax Policy Center, headlined the all-day conference — which began with a keynote address by Chip Harter, deputy assistant secretary for international tax affairs at the U.S. Treasury. The event was cosponsored with Vienna University’s Institute for Austrian and International Tax Law, the Inter-American Development Bank and the Digital Economy Taxation Network, with sponsorship from Ernst & Young, Tax Notes and Vertex. At the Organisation for Economic Co-operation and Development, the United States has discussed broad challenges facing the international system. “We have an opportunity to restore an international consensus around the allocation of a taxing jurisdiction, and place that consensus on a more stable basis going forward,”Harter said. And “very real progress is being made in this effort,” he reported. “When the digital task force meets this week in Paris, it will work on a plan to reach a multilateral agreement for new international standards in two important areas” — an internationally agreed minimum tax regime similar to U.S. tax reform in this area and an agreed inbound base erosion regime that will enhance the ability of jurisdictions to tax an appropriate level of return on transactions, not limited to digital companies. Faulhaber, Grinberg and Owens led panels looking at new business models and emerging technologies; proposals to adapt the international tax system to address the age of digital disruption; how the interaction between new technologies will transform tax; and new opportunities and challenges for tax policy as new technologies emerge. “We look forward to finding out whether or not the digital economy is in fact special—and whether the new rules that have been proposed and implemented by a variety of countries that Chip mentioned are…justified by differences of the digital economy,” Faulhaber said at a panel called “Are You Special? New Taxation Rules for the Digital Economy.” The panel included Grinberg, who discussed tax proposals at the OECD. Mark Prater of PwC led Grant Aldonas, the executive director of IIEL and the former U.S. Undersecretary of Commerce, in a conversation on digital taxes as a trade barrier that included potential challenges for Robert E. Lighthizer (L’73), the U.S. Trade Representative.